When an Air Plug is used with a hose, it should be equipped with a Handle to avoid excessive strain on the air connection and corrosion on the polished plug body. Handles may be combined for gaging deep holes. Selection of a handle or extension is determined by the bore itself and whether or not it is preceded by a larger C-bored diameter. Corresponding thread sizes of the handle or extension must also be considered. If no portion of the handle or extension enters the part, only thread sizes must be considered. If the plug does enter the part, then both O.D. and thread size must be considered. AHA-4 and AHA-5 Extensions — accept AHO-1 Hose on one end and the following plug sizes on the opposite end: all 1250:1 thru 8000:1 plugs up to 76.45mm/3.010in (except 2500:1 thru 8000:1 blind hole plugs with 9.53mm/.375in – 11.86mm/.467in diameters). AHA-6 Handle — accepts AHO-1 Hose on one end and the following plug sizes on the opposite end: all 1250:1 thru 8000:1 plugs up to 76.45mm/3.010in (except 2500:1 thru 8000:1 blind hole plugs with 9.53mm/.375in – 11.86mm/.467in diameters). Has Bakelite insulating cover. Recommended for 37.85mm/1.490in up to 76.45mm/3.010in diameters. 2237666 — High impact and coolant resistant, light weight composite handle — normally furnished with uDimensionair and air snaps. AHA-66 and 2236070 — light weight aluminum handles without or with air shutoff valve. AHA-15 Handle — Used and furnished with 1250:1 thru 8000:1 through or blind hole plugs over 3.004” diameter. AHA-23 and AHA-24 Handles — Used with 10000:1 thru 32000:1 plugs. AHA-28 Handle — Used with 2500:1 thru 8000:1 Blind hole plugs in the 9.47mm/.373in to 11.86mm/.467in range, using an AAD-315 Adaptor. AEX-1 and AEX-2 Extensions — Used with 2500:1 thru 8000:1 Through hole air plugs in the 9.5mm/.3735in to 14.1mm/.556in range and with 11.86mm/.467in to 14.1mm/.556in range blind hole plugs, using an AAD-55 Adaptor. 2201975 — extension used with BA-100 adjustable base. 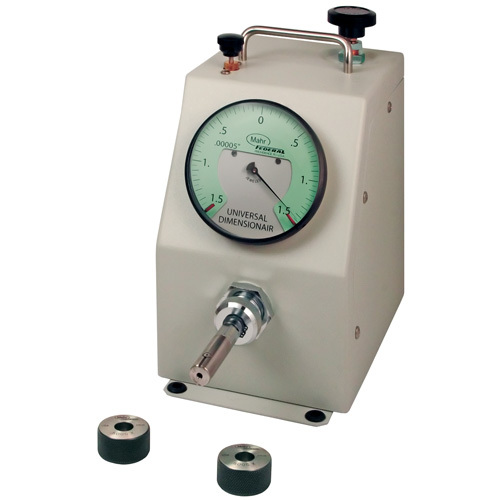 Provides easily configured base for bench-mounted air tooling fixturing.